The process of promotion of the Catholic faith in a city which at one point had largely embraced the Lutheran Reform was largely lead by the Jesuits, the spearhead of the Counter-Reformation effort. In 1556 Emperor Ferdinand I called to Vienna the Jesuit Pietro Canisio, Italianized name of Peter Kenijs, a Dutch theologian, to develop a strategy to regain the inhabitants of Vienna to their old faith. 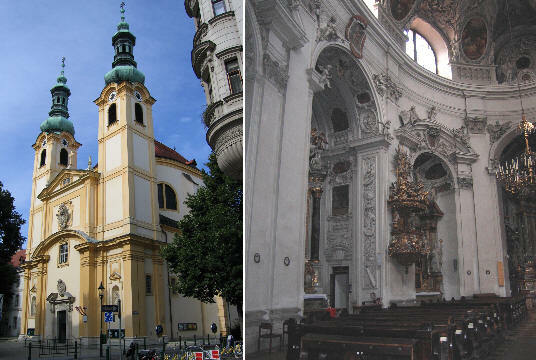 In 1623 the Jesuits were entrusted with teaching theology and philosophy at the University of Vienna and soon after they built a church next to it. The statues which decorate the church have many points in common with those on the façade of Chiesa del Gesù. The rich decoration of the interior is another link between the two churches. The church was in part redesigned (both exterior and interior and between 1703 and 1707) by Andrea Pozzo, the Jesuit who had become famous for the ceiling he had painted in S. Ignazio in Rome. He was asked to paint a copy of the fake-dome he had devised for S. Ignazio. The Dominicans were another order involved in the preaching effort. Their church has a definitely Italian appearance and in the interior the ceiling shows patterns developed in Italy (the image used as a background for this page shows the Dominican symbol in SS. Domenico e Sisto in Rome, a church which has the same vertical thrust as Dominikanerkirche). Kirche 'Zu den neun Choren der Engel' is another church with a very distinctive Italian architecture: its unusual name means "the nine angelic choirs" and it belonged to the Jesuits. It is located in one of the largest square of old Vienna on the site of the ancient Roman camp. Its balcony was used to make important announcements: Pope Pius VI in 1782 visited Vienna in an attempt to convince Emperor Joseph II not to go ahead with his religious reforms: from the balcony he gave the papal blessing and in 1806 Emperor Francis II announced the end of the Holy Roman Empire. Old views of Vienna name a church next to the cathedral as the "Italienische kirche", but Emperor Joseph II must have closed it as he limited the activities of religious orders (the Jesuit order had just been disbanded by Pope Clement XIV). He therefore assigned to the Italian community the medieval Minoritenkirche. The number of Italian artists who worked in Vienna in the XVIIth century is quite impressive; the majority came from northern Italy and in particular from Lombardy (for a list of Italian artists in Austria click this external link). Also the medieval Schottenkirche, named after the Scottish Benedictine monks who founded it, was largely modified in the XVIIth century by Italian architects; its lateral view was chosen by the painter Bernardo Bellotto in the XVIIIth century for one of his finest views of Vienna (to see the painting click this external link). Not only Italian artists looked for a job in Vienna; also army leaders went there to offer their services to the Roman emperor. Turkish and Hungarian raids, religious conflicts, the rise of new European powers such as Sweden and Russia, all contributed to a state of almost permanent war in the first half of the XVIIth century. Ottavio Piccolomini fought for the emperor in the frame of the religious wars which lasted for thirty years (1618-48). He eventually retired and resided in Vienna: he must have felt guilty for the many massacres he had taken part to. He therefore paid for the erection of a church and a (Servite) monastery in the outskirts of Vienna. Servitenkirche is the first church in Vienna having an elliptical shape: a design introduced for the first time a few years before by Francesco Borromini in S. Carlo alle Quattro Fontane. Servitenkirche paved the way for the many elliptical churches built in the next century in Vienna. The coat of arms of Ottavio Piccolomini can be seen also in Rome and Siena, but in particular in Pienza, the town founded by Pope Pius II, Enea Silvio Piccolomini.